Came across this site last week. Looks like some really well made leather bags. Will probably pick one up soon. I'm saving up for this bag atm. soon... there isn't any pockets inside, it's just one big compartment tho. Wow. seems like they are all very well made. 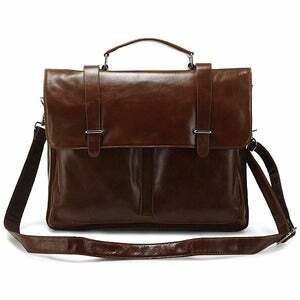 Anyways, I came across one of Coach's newsletter the other day, and it seems like they too, have a pretty good selection of leather messenger bag for guys. The price is +/- $150-ish, similar to what you showed us up there. Nikes and Jordans (All Star Lebron, Toro, Foams, Black Toe) for sale! Have you tried Danier? I've heard their bags are alright for the price (especially when on sale). Knomo's are also very nice, except a little pricier. Danier's Philip Sparks collection is excellent. What do you guys think of hanpu koubou, the te-Koop Japanese import brand? I took the plunge and ordered the one pictured above last week. Arrived today (DHL from Shanghai with no duties) and it's a quality leather messenger bag. I like the fact it's made in America. That is so rare these days. Awesome!! I have been waiting for a chance to put an order in for a bag too...still havnt been able to decide on which one I want yet...probably one of the crazy horse ones. But great to hear you had a great experience with it!! Would love to see more pictures! briefcase... but comes in 5 colors yo. Here is mine, I think it was called the "Editor's Bag"
How come people on this forum always post Hermes stuff? Does it make you feel like a BOSS / BALLER to make these suggestions? is it best for bag to match shoes? i need a bag. thinking either black or brown. mostly wear black dress shoes.